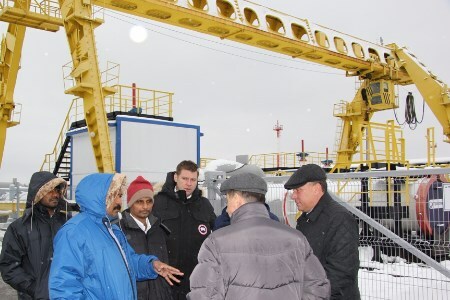 Transneft Diascan has recently been visited by the delegation of Sriram Foams, based in India. The delegation was led by Director General Muthukumar Pampaian, who was accompanied among others by Babu Ramesh Krishnan, Marketing Director and Sasidharan Sarangapani, Marketing Manager. The guests were shown inspection devices developed and manufactured by Transneft Diascan: ultrasonic and magnetic defectoscopes, as well as a device identifying the pipeline location. Representatives of the Indian company visited the test facility where inline inspection tools are tested. The delegation also visited the test laboratory, where pipes are checked for strength and life duration after the defects are eliminated using different methods, and were shown two shops: the machining shop and the polyurethane production shop. During the visit, a meeting was held at which the parties exchanged information on their activities and discussed the potential co-operation options.